List of USGS information resources used in carrying out the Sagebrush Mineral Resource Assessment in 2016. 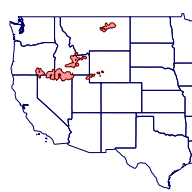 Map showing the geographic area discussed or described by each USGS reference source used. The geographic distribution of these sources can be displayed in your GIS software using this web service, which conforms to the Open Geospatial Consortium Web Map Specification.